The overnight low temperature read 33°F on our deck in Crested Butte on Saturday night. That’s just ONE degree above freezing. I am overjoyed. As we said our good-byes this evening at our annual neighborhood picnic, I noticed everyone had donned their fleece or down jackets. Despite warm (70s) temperatures in Crested Butte during the day, it is deliciously cool when the sun drops low in the sky. You can feel it – the turn that summer takes in the high country when it’s no longer hot from day to night, but hot and cool. A subtle change, but you feel the presence and some of us get a little giddy. 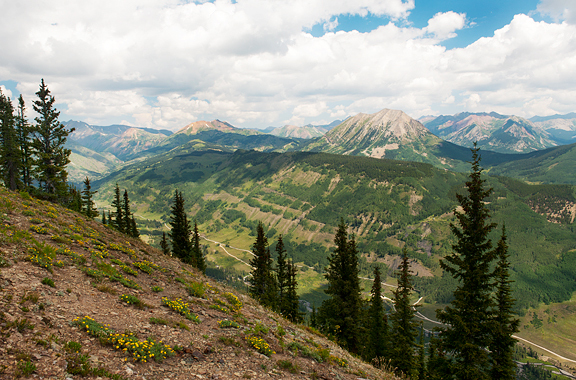 Going from Nederland to Crested Butte has me shifting gears. 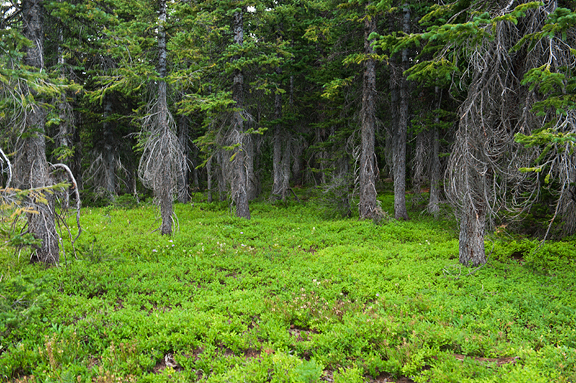 There is a whole different set of trails to run, hike, or forage. Weather patterns are different. 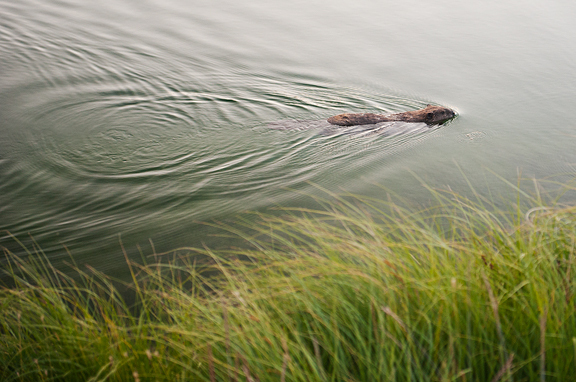 And instead of photographing towering moose who could charge me and my camera equipment in an instant, I am stalking adorable beavers swimming recreational laps in their lakes who pose zero threat to anyone who isn’t a tree. Shortly after we got our place in Crested Butte last year, our favorite sushi bar in town shut its doors for good. Jeremy was pretty heartbroken, but living in Colorado mountain towns, you get used to either doing without or doing it yourself. If it’s food-related, I generally go for the latter. As sushi goes, some recipes come down to whether or not you can source an ingredient. However, there are items you can make from pretty basic ingredients. 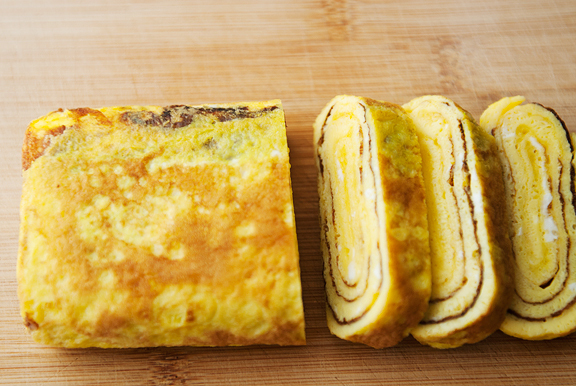 One of my favorites is tamagoyaki, a Japanese rolled egg omelette. 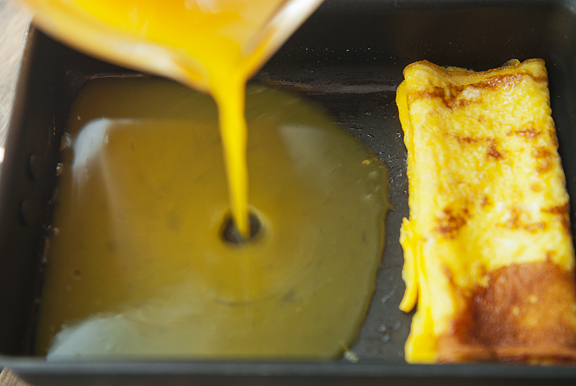 The traditional shape of tamagoyaki is that of a rectangle, because there is a specific rectangular pan used to make the omelette. 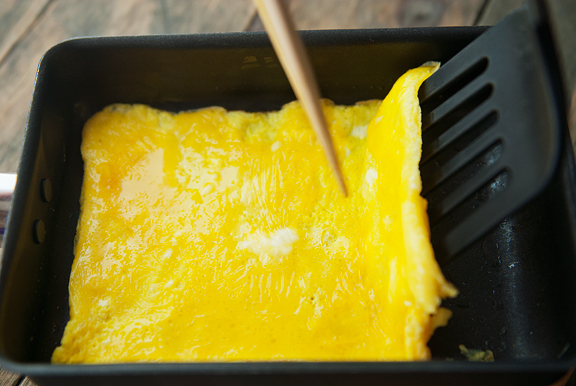 You can use a standard round omelette pan to make your tamagoyaki, just trim the edges so you wind up with a rectangle and no one would be the wiser. 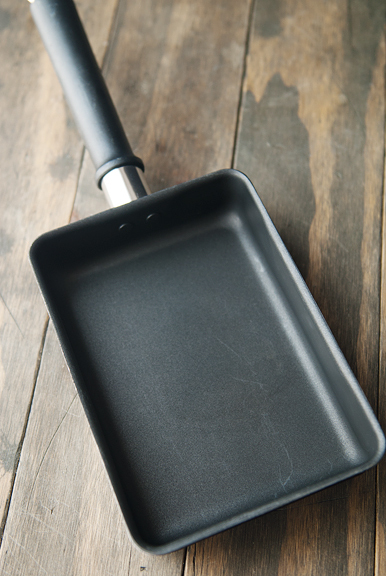 I just happen to own a tamago pan because I bought it on a lark over a decade ago and never made tamagoyaki in it until last week. Hey, at least I’m using it now! The main gist of the omelette is to cook a quarter of the egg mixture until it is set and then fold it in thirds. 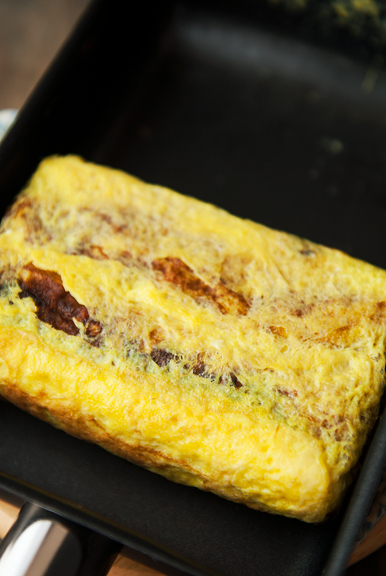 Push the rolled omelette to one end of the pan and add more egg mixture to cook. 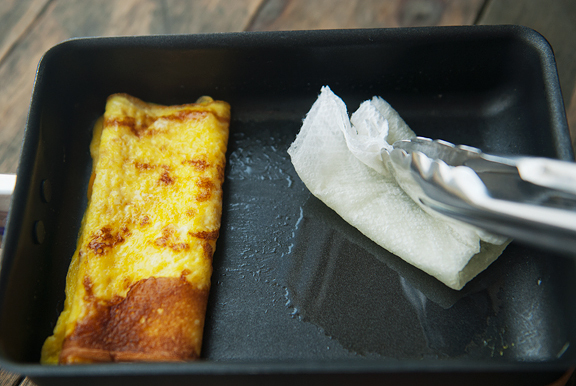 When it sets, fold the omelette back on the new egg sheet and repeat the process for the rest of the egg mixture. You will wind up with a rolled omelette of several layers. And it doesn’t have to be perfect. I overcooked my egg sheet layers while shooting the process and it was still awesome! Just don’t undercook the egg. My favorite way to enjoy tamagoyaki is in a charashi bowl with a nice assortment of sashimi and vegetables. Make it as simple or as fancy as you like depending on what ingredients you can get your hands on. If you live near a good Japanese or Asian market, you will probably find various fresh sashimi-grade fish. 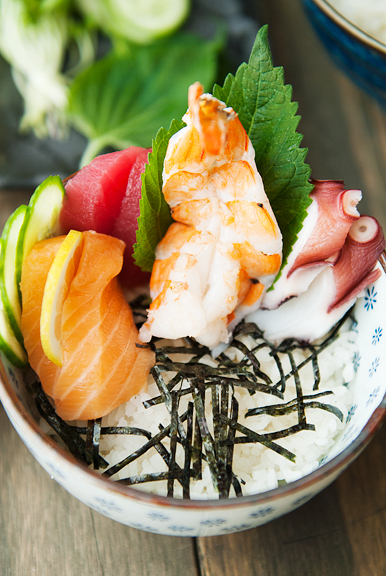 Sometimes Whole Foods or other seafood vendors will have sashimi-grade fish. Sashimi-grade means that the fish has been frozen to low enough temperatures to kill any parasites – that’s why you don’t purchase a hunk of random salmon and slice it up for sushi. Other items that some Asian markets will carry include grilled eel (unagi), octopus (tako), surf clam, masago or tobiko (capelin or flying fish roes). But even if you can’t find good fish, you can always use cooked shrimp, tamagoyaki, vegetables, and whatever else you want. If you go to the trouble of cooking rice, you may as well go the extra little step for seasoning it. Seasoned sushi rice really brings out the flavors of your sushi and other ingredients. It’s just salt, sugar, and vinegar, but it makes a huge difference. Trust me. The rice is the base layer of your chirashi bowl and you can sprinkle sakura denbu (a pink sweetened flake cod condiment) and kampyo (picked gourd) and roasted seaweed strips on top. I could not find sakura denbu nor kampyo anywhere, so I omitted them. If you really like having some seasoning, I think furikake would work. Then arrange your goodies over the rice. I like to drizzle a little unagi sauce over the eel, tamagoyaki, and octopus and then sprinkle some toasted sesame seeds. The reason I love ordering chirashi bowls at sushi bars is because of the variety in one bowl. It’s hard to get that much variety at home unless you have many other chirashi bowls to make before the fish spoils. 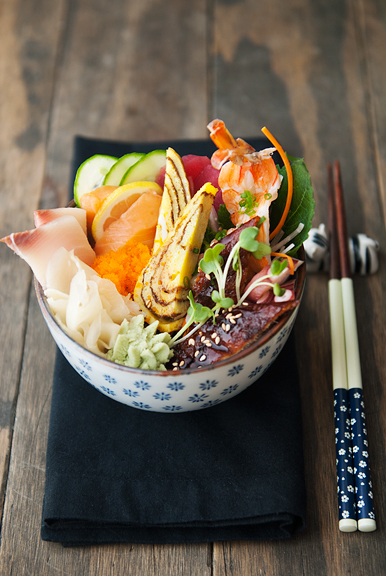 Although, it’s a great excuse to have a chirashi bowl party. 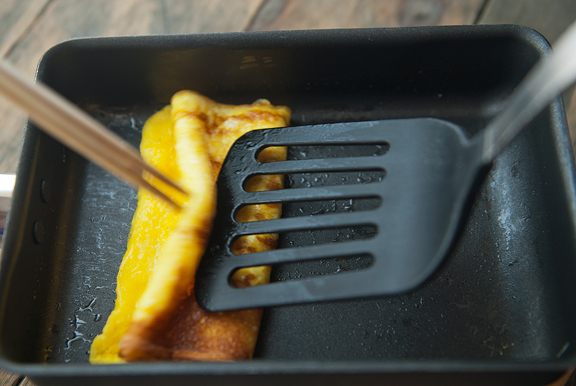 Like I said, make it as simple or as fancy as you like – but now you can include your own kickass homemade tamagoyaki. 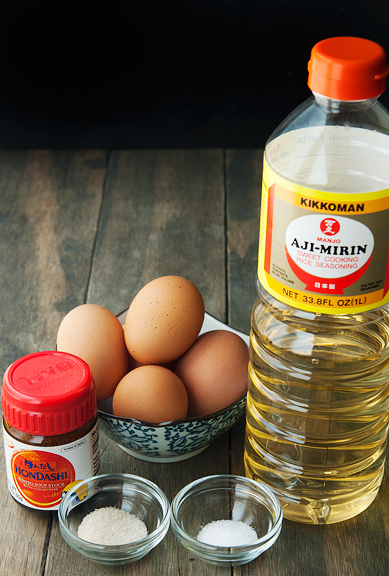 Make the tamagoyaki: Beat the eggs in a medium bowl until well blended (we don’t want big globs of egg white floating around). 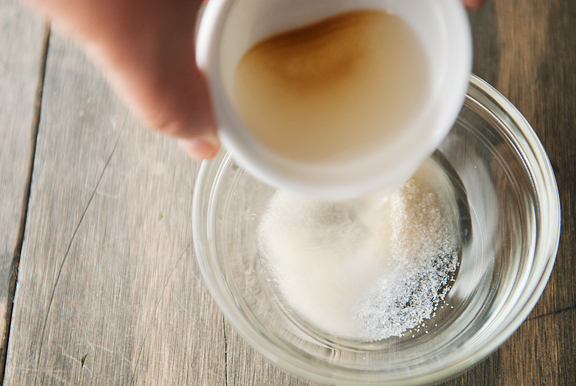 Mix the dashi stock, sugar, mirin, and salt together in a small bowl and stir until the sugar and salt have dissolved. 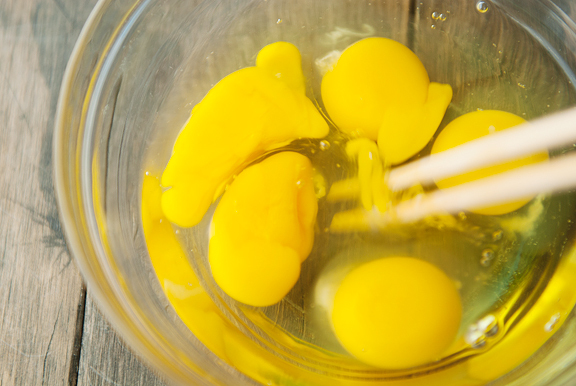 Beat the dashi mixture into the eggs until incorporated. 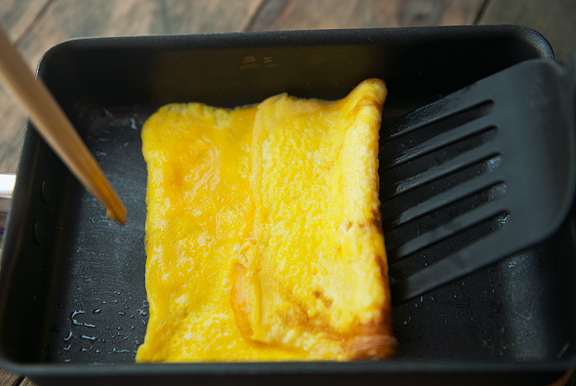 Heat your tamago pan or a small omelette pan over medium flame. Dip a paper towel into a small bowl of vegetable oil so that it soaks up some of the oil. 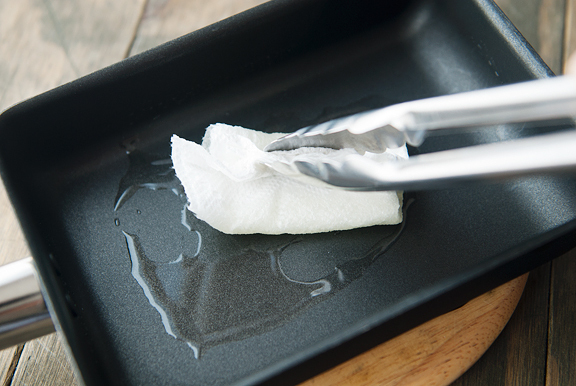 Using tongs or chopsticks, evenly oil the pan with the oil-soaked cloth. 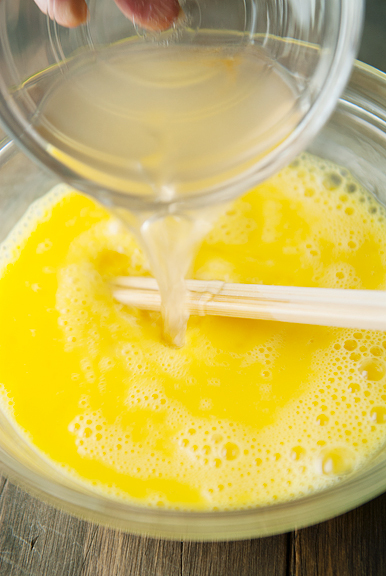 Pour one-fourth of the egg mixture into the pan and cook until it is set and almost cooked. Grab the far end of the egg sheet with chopsticks and fold a third of the sheet over on itself toward you like would a business letter. I find a spatula helps too. Fold the egg sheet toward you again so that it is folded in thirds. Push the egg to the far end of the pan. Evenly oil the rest of the pan. Pour another fourth of egg mixture into the pan making sure it gets under the folded egg omelette (you want them to connect). When the egg has set and is almost completely cooked, fold the omelette in thirds toward you (just like before, but you are making layers). Repeat until all of the egg is used up. 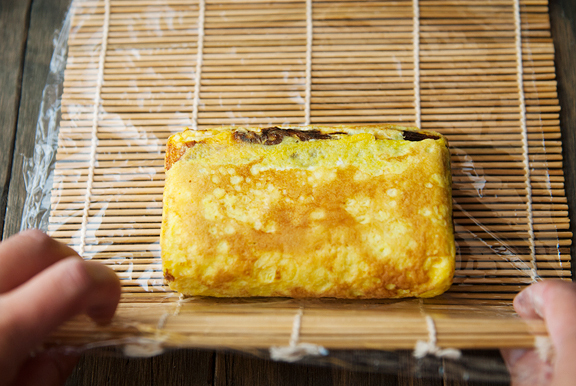 When the omelette is done, remove it to a bamboo mat (optional: line it with plastic wrap) and gently press the omelette into a square shape. Slice into 1/2-inch thick slices crosswise to the folding pattern. Makes about 12 slices. Make the sushi rice: I use a rice cooker. Combine the water and rice and cook per the instructions on your rice cooker. If you don’t have a rice cooker, you can try these instructions (I’ve not done them myself): Wash, drain, and soak the rice in water for at least 30 minutes, then drain. Combine the rice and measured water in a saucepan and cover. Place the pan over moderately high heat. When the water boils, reduce the heat and cook for about 10 minutes. Turn off the heat and allow the rice to steam undisturbed for at least 10 minutes (don’t remove the lid or you’ll ruin it). 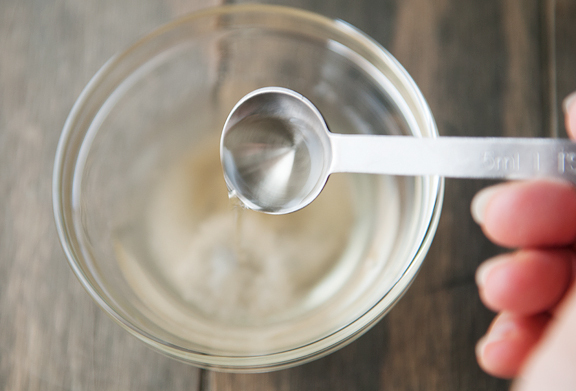 Combine the vinegar, salt, and sugar in a bowl and stir until salt and sugar are dissolved. Wet a mixing bowl large enough for the rice. Wipe off excess water. Wet the tub a second time with vinegared water (1 cup water + 2-3 tablespoons vinegar). Wipe off any excess. Heap the cooked rice in center. Allow rice to cool in the tub for 10 minutes. Pour the dressing over the rice and mix the dressing evenly with a large spoon or rice paddle. While mixing, fan the rice to cool it. The rice is ready to use when it reaches body temperature. 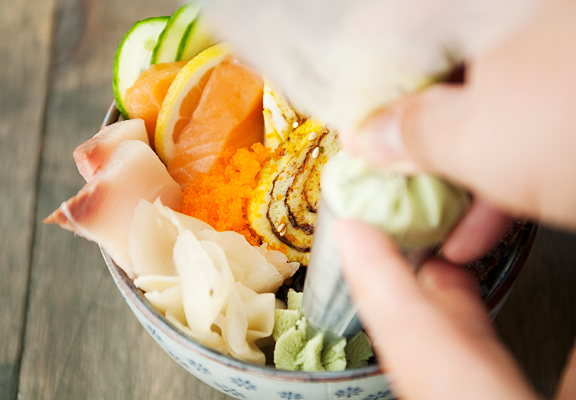 Assemble the chirashi bowl: Place the sushi rice in a bowl with a 2-cup capacity. If using, sprinkle sakura denbu (a pink, sweet, flaked cod condiment) and kampyo (pickled gourd) over the rice. If not using, don’t worry about it. 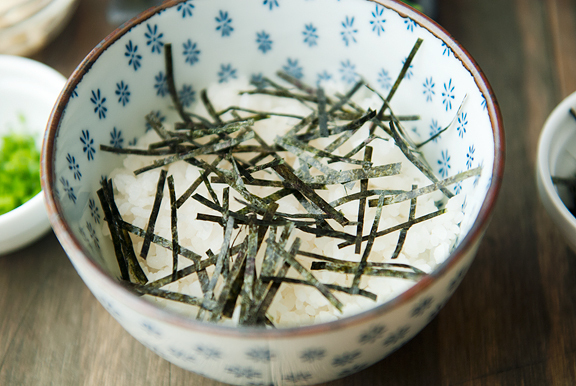 Sprinkle the shredded seaweed over the rice. 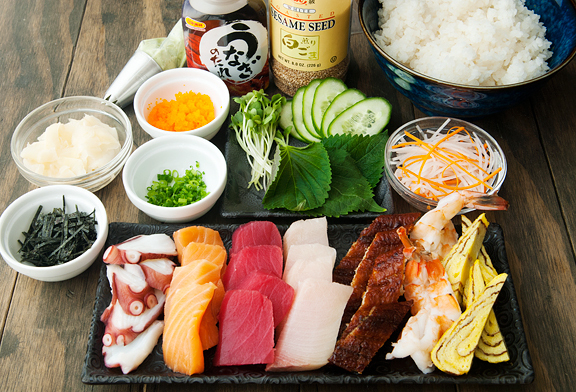 Arrange your assortment of sashimi: salmon, yellowtail, tuna, shrimp, eel, octopus, tamagoyaki, and fish roe on the rice with the cucumber slices, shiso leaf, green onions, shredded daikon radish, and daikon radish sprouts. Make room at the edge for some pickled ginger and wasabi. Brush or drizzle a little unagi sauce over the eel, tamagoyaki, and octopus. Sprinkle withe toasted sesame seeds. Serves 1. Tamagoyaki is one of those things I keep trying to perfect but fail at every single time. It’s so hard to perfect… But my attempts are delicious so at least there’s that. WOW, the chirashi looks amazing. My husband really likes tamago but it seems that most sushi places don’t make their own in house. Can’t wait to try it at home! Wow. I’m so impressed by how much beauty is in that dish! You are amazing! My husband would die for that dinner! Sadly, he’s been sick these last few months and hasn’t had a taste for sushi – definitely book marking this for when he’s ready for it. Otters are so flippiing cute! And this bowl is absolutely stunning. Sherry – the good thing is that practice is delicious! Kath – chirashizushi is pretty common in sushi bars. You should ask if they have it (they can probably make it for you even if it isn’t on the menu). It’s one of my favorites – a little bit of everything! Pey-Lih – because it’s even tastier than it looks! Kristin – ha ha, yes. 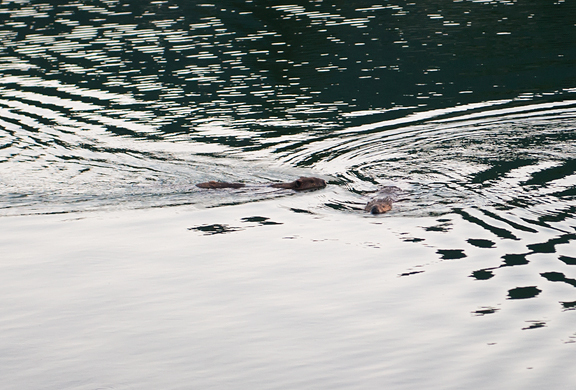 Otters ARE super cute, but these are beavers. Actually, otters are cuter than beavers, but I love beavers because they’re nature’s engineers! I love that you posted this. My good friend, Andrea, and I had attempted to make tamagoyaki earlier this summer and let’s just say that it was not nearly the success that yours appears to have been, though we had a grand time attempting it. 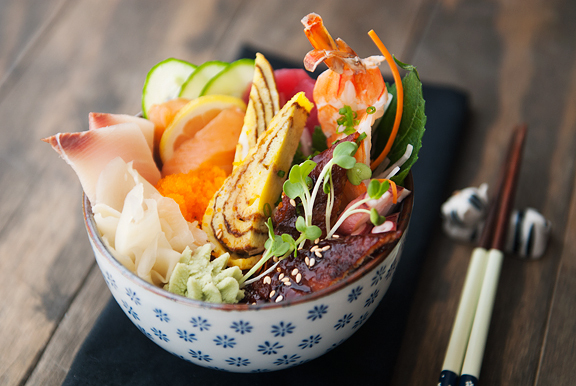 And your chirashi bowl looks like heaven. Gah…and I READ beavers! And we were just scoping out dams. Sorry! What do you do with the leftover dashi? Magda – I usually use it with miso soup or if I made tempura, I’ll use it to make the tempura dipping sauce.